We think movies, TV, books, games, and other media should be more representative of the world we live in. Our goal is to gather together people who are at all stages in our creative careers to share what we know with each other. The weekend starts on Thursday evening with a social gathering. Friday, Saturday, and Sunday will be group-directed conversations, classes, panels, and meals together in small or large (but not too large) groups. We are all the instructors and we are all the students. We are co-learning in community this weekend. We share what we know. We learn from each other. The student becomes the teacher. We create the world in which we wish to live. Writers Weekend started in 2003 in our back yard in Bellevue, Washington. 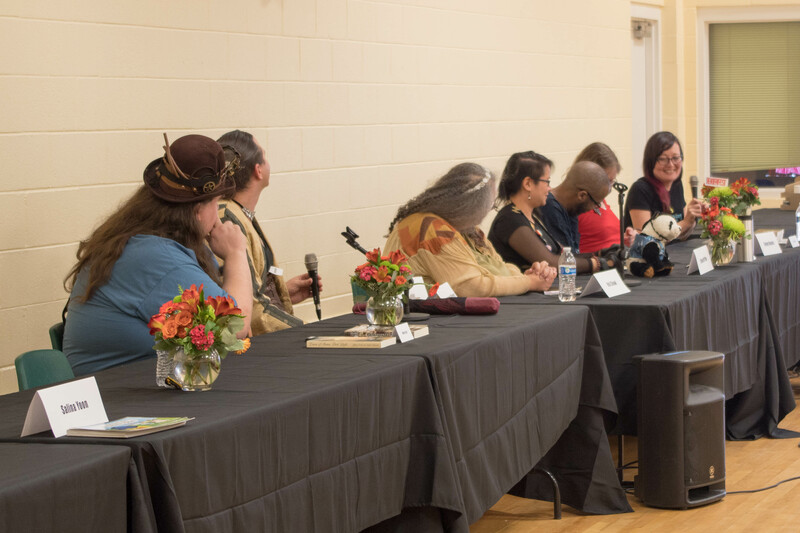 That first year, we had four editors from Tor, Mercedes Lackey, Larry Dixon, Steven Brust, and a host of new and experienced writers who met to exchange ideas. Since then, we've organized many more workshops and events to bring creative people together in amazing ways that have led to some spectacular stories. Now we host events in locations all across the US. We think we've chosen some great places to gather together and see what we all come up with next. We are organizing these Writers Weekend events under the auspices of a non-profit called Readerfest in the State of Washington. Here are a few of the dedicated volunteers who are helping us make our destiny. Karen has been a fan of writers for a long time. She organizes writing workshops for fun. Kathya is an actor, playwright, and activist in Seattle. If you would like to join us, please email Realreaderfest at gmail dot com or call 425-443-3895. We are asking for donations to help with covering the cost of airfares, meals, and lodging for our guest instructors. If you are not able to pay, we have been given a generous donation by a supporter from That Famous Company to cover scholarships. Just ask.